We need to get going on this whole holiday thing. 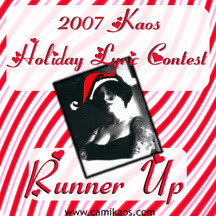 There’s no time to waste so without further ado I present to you the winners, runners up and participants of the 2007 Kaos Holiday Lyric Contest. Jamie entered a naughty song titled The Disappearance of Santa. Mielikki entered a naughty song titled Christmas Gone Wrong. Lori entered a naughty song titled Santa’s Ho. Troy entered a naughty song titled Be My Christmas Angel. Mr. Fabulous entered a naughty song titled Santa’s Lament. Congratulations to all who won and entered. We had such a blast reviewing all of your songs, so much so in fact that we have vowed to do it all again next year. The badges shown with your names are for you; I hope you enjoy your badge, feel free to display them proudly you all rocked! Jo: We hoped to record yours over the weekend but the weekend seems to have gotten away from us… we’re so sorry for that, we will climb on top of that song and force it into musical submission very soon. With that I say to all of you Merry Christmas; be it naughty or nice, I hope that you can enjoy it. Cami and the Kaos Family…. Merry Christmas Cami! I hope you and the Kaos clan have a holly jolly time! what a brilliant song! It got the Squidge seal of approval- she was shaking her bootay all over the livingroom… video to follow soon. Yes, I second that holly jolly wish for you all. Merry Christmas to All…. and Lindy I CAN’T WAIT to see that squidge vid. Merri Christmas!!! hugs and kissesthe song is totally awesome.